There’s an RIT Web site featuring before and after pictures of students who are taking a class in graph theory. All of them are smiling. And yet, Shahmohamad has a tough job to sell to his learning constituents—who most likely wonder how courses in discrete mathematics, combinatories, rook polynomials and graph equivalence can help them in their daily lives. 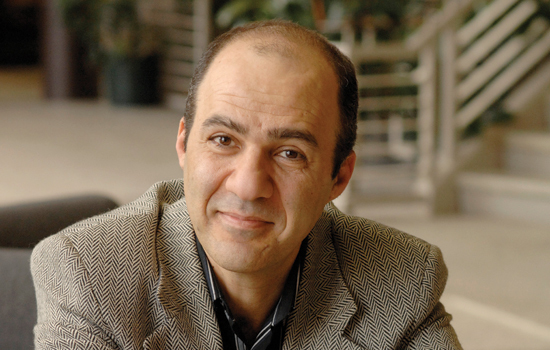 “Life is about optimization, minimizing cost, maximizing revenue,” Shahmohamad explains. “You need mathematics every day, even to buy a better box of cereal at the grocery store. If that’s the case, Shahmohamad is probably an advanced Pentium processor because he just earned another degree and will be graduating with an M.B.A. in management and leadership from RIT’s E. Philip Saunders College of Business this May. He previously received his undergraduate and master’s degrees in mathematics at California State University at Long Beach, and his doctorate in mathematics at the University of Pittsburgh. In between, the Pittsford resident enjoys family life with his wife, Sahar, and their young son, Shayan. Born in Iran, Shahmohamad is fourth in line out of five children—resulting in a crisscross of four continents to visit family and friends. And yet, he never jogs or bikes along the canal—located a few yards from his home. “It’s funny because people who live in Paris never go up to the Eiffel Tower and those who are in Toronto never go up to the CN Tower, and likewise I am not taking advantage of what’s sitting right in front of me,” he says with a laugh.